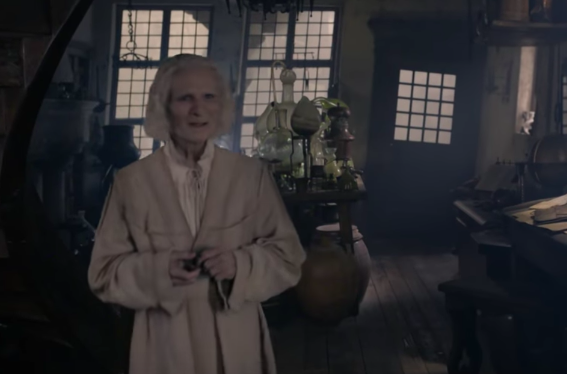 Breakdown of the ‘Fantastic Beasts: The Crimes of Grindelwald’ Comic-Con Official Trailer! BigNews, Exclusives, Fan Events, Fandom, Fans, Fantastic Beasts Movie, Movies, News, Posters, Warner Bros. Opening an epic theatrical panel featuring a surround-screen room, the core cast and Deathly Hallows bands, Warner Bros delivered the Fantastic Beasts: The Crimes of Grindewald official full-length trailer at San Diego Comic Con today, adding to our questions about the series! A new poster puts Nicolas Flamel front and centre in this film, and during the panel we saw Eddie Redmayne and Jude Law chat about the film with Zoe Kravitz, Ezra Miller, Alison Sudol, Katherine Waterston, Dan Fogler and Claudia Kim, and Johnny Depp came out onstage in-character as Grindelwald. Here’s our official breakdown of the trailer – if you haven’t seen it, view it below! “I’m scared, Professor Dumbledore,” says Newt. 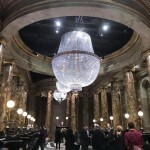 We’re taken to a Hogwarts castle, inside the Defence Against the Dark Arts classroom (Jude Law explained in a recent interview that Dumbledore isn’t Transfiguration professor – as in canon – yet). 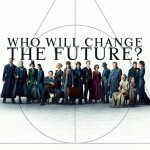 The class are learning Ridikkulus – but is that Leta Lestrange behind Newt? 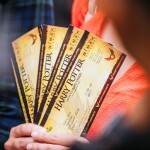 The class laughs, and we see that characteristic sparkle in Dumbledore’s eye – Jude Law’s got mischievous-Dumbleodre down to a T.
The trailer quite literally explodes into the present (well, less-past, we guess), soundtrack intensifies as the Warner Bros and Wizarding World logo apparates onto the screen. These are darker times. “Magic blooms, only in rare souls”, Grindelwald says as a female statue beckons. The shot of Tina looking mysterious is her in front of this wizarding statue, clearly sneaking around. Circus Arcanus appears, and we see Credence looking at their tour poster. Newt and Dumbledore apparate from a London bus in the fog, Dumbledore uses the Deluminator on a London street (as in the first trailer) – they’re also sneaking around London, by the looks of it. Grindelwald is shown in an incredibly unfortunate and uncomfortable position being dragged through what is assumedly the MACUSA jail he’s destined to escape from in this film. Inmates look on. “I take it you’ve heard the rumors?” says Dumbledore. We see a haunting shot of Grindelwald and Credence, and Grindelwald’s henchpeople (basically Death Eaters). Newt is shown (above) disapparating from ‘Merion’ Street in London. It’s in the EC2 area. “I can’t move against Grindelwald” Dumbledore says, and a heartbreaking scene appears, of him looking into the Mirror of Erised and seeing him and Grindelwald… There’s clearly more to this relationship to be unpacked, as Jude Law said in his interview recently. “It has to be you… In your shoes, I’d probably refuse too.” he says to Newt, with a flare. Giving him a nod he says “and it’s late… Good evening, Newt.” and disapparates off into the distance. “Oh, come on!” Newt says in disbelief… We’re right there with him. Really, Albus? “You underestimate your talents, Mr Scamander.” We hear (who’s voice is that? Dumbledore’s? ), as we see a tank in what could be Newt’s basement, which appears to hold Newt and the Kelpie – is that Bunty? 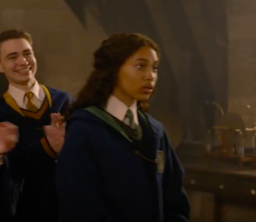 UPDATE: That’s definitely Bunty, Newt’s assistant! “THE FATE OF ONE” appears on the screen as Grindelwald walks into the public eye, looking concerned. “Their arrogance is the key to our victory” says Grindelwald, we see Jacob emerge into a vault of some sorts, what appear to be Grindelwald’s followers in a darkened alley, Credence and the Maledictus on the roof, Credence using his ‘Obscurus powers’. “THE FUTURE OF ALL” appears, as we see wizards disapparate from Grindelwald’s rally (which looks significantly emptier in this shot – did it go down well, or not?). Dumbledore looks concerned, as Grindelwald appears opposite him. “Muggles are not lesser,” says Dumbledore, as we see Jacob looking at the new beast from the first trailer. Leta is shown in the French ministry near some rapidly moving vaults with Newt and Tina – she appears to be helping them (is she working at the Ministry?). Queenie sits in the rain with her hands over her ears – is this something like the ‘voice inside your head’ charm that Voldemort used in the Battle of Hogwarts, or is Grindelwald somehow in her head? Newt and others (Theseus, Tina and more) are shown fighting the blue flame in what looks like a cemetery, as in the first trailer. Newt faces a new beast with his suitcase – is he about to rescue the ‘Oni’ from Circus Arcanus? *UPDATE* This beast is actually, in fact, the Chinese beast David Heyman & Yates referenced in our earlier interviews with them (so not Fawkes, as we and many others were theorising!). Eddie Redmayne announced that this creatures is a ‘Taowu’ in an IGN interview at San Diego Comic Con, which you can find in our interview round-up. Also see a theory below from Susan Sipal, asking whether we could be heading to China next in the series (meaning we could see more dragons!). See this thread on Twitter for more discussion on the new beast, translations & surrounding mythology. If any fans have any other interpretations, translations, or information on this creature, we’d love to hear them! Is she referring to herself? Is she about to betray the quartet? Newt calls Credence, as we see the ruins he’s created. He appears to have his terrific power under control, and is causing havoc among what appear to be Grindelwald’s henchmen. We see the thestral draw carriage being flown by Grindelwald – his escape from MACUSA, as shown in the new LEGO set. “Mr Scamander!” Grindelwald calls, and we see Theseus and Newt, and others (unclear) in the background. There’s clearly a showdown between the two at some point. Roll the Deathly Hallows symbol and the title screen. Jacob appears with a pale figure in the background. He looks terrified, and gulps: “Are you a ghost?” he asks. “Oh.” says Jacob, looking uncertainly at the hand put in front of him. “Nicolas Flamel,” says the figure (note: pronounced nih-coh-lah). Jacob just about breaks his hands as he goes to shake it in greeting. 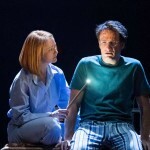 Immortality leaves one rather frail and zombie-like, it appears – or has something happened to the Philosopher’s Stone? Could Voldemort have derived his ideas from Grindelwald? “You don’t look a day over three-seventy-five!” jokes Jacob, clearly unnerved. Us, on the other hand, we were delighted to see the alchemist at long last! What did you think of the trailer? Any new theories thanks to the secrets it unveiled? See our coverage live from the Warner Bros panel here, and watch out for more coverage of SDCC coming soon. Be sure to let us know your thoughts in the comments, or via Twitter, Facebook or Instagram!